Keeping with the Valentine theme I started with my last post, I have made a couple more cards along the same lines! 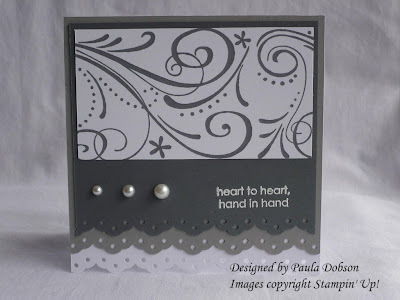 This one is a simple emboss resist card. 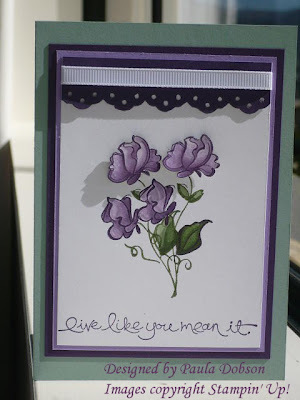 I stamped my image on Whisper White card stock in Versamark and embossed with clear embossing powder. I then took my trusty sponge (you all know how I LOVE sponging!) and in a circular motion added Real Red Ink, slowly building the colour as I went. I decided to leave it as a tone on tone and I am really happy with the simplicity of it. This is also my entry into the Just Add Ink Challenge (JAI2) for this week. Click on the badge in my side bar to check all the other beautiful entries!! Check back here in the next day or so to see the Valentines card I have planned for my husband. Shhh!! You have to keep it a secret though! Hard to believe that January is nearly gone already!! That means the next celebration must be Valentines Day! February 14th is fast approaching so I thought I had better make a start on those very special cards. I decided to keep the message short for this card! Although I couldn't resist adding a rhinestone for a bit of bling. I have also added an insert and wheeled a narrower strip with So Swirly than on the front, so I could also bling on the inside!! 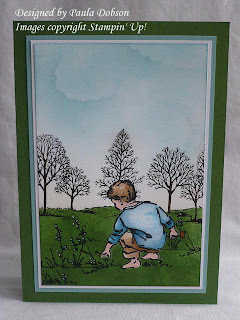 I have been having a fantastic time lately designing cards for my class and various challenges I am involved in. When I came back from holiday, the well was running dry!! I am pleased (and a little relieved!) that the ideas are flowing once again. 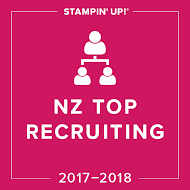 Thats is partly due to the current promotion from Stampin' Up! SALE-A-BRATION is now on!! Running from the 25th of January until the 31st of March, there has never been a better time to stock up on your crafting supplies! 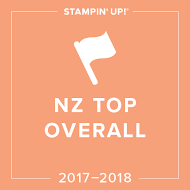 Four great Stamp Sets and three great reasons to celebrate!! 1. 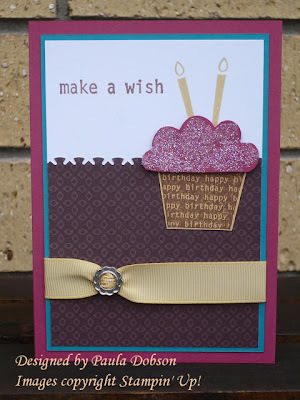 Spend $120.00 and earn a FREE Sale-a-bration stamp set of your choice. 2. 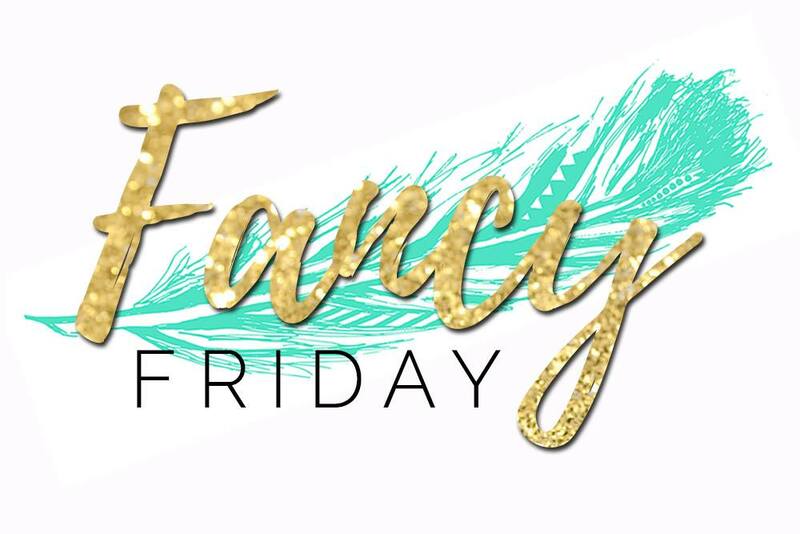 Host a workshop of at least $700.00 and earn a FREE Sale-a-bration set in addition to a FREE Level 2 Hostess set and $80.00 worth of FREE product from the SU range. 3. Join MY TEAM during Sale-a-bration and choose a FREE stamp set from the Idea Book & Catalogue (valued up to $93.95) and of course, the fantastic Demonstrator Starter Kit. Whether you just want to take advantage of the demonstrator discount or you would like to earn have your own income, NOW is the time to join! Email me and I will send you out all of the details you needed to start. 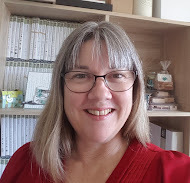 If you would like to visit this wonderful new site, just click on the Badge on the right of my blog list. I dare you to have a look! 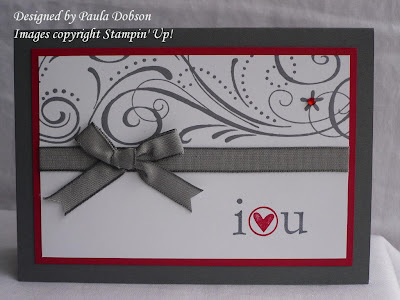 I love how Stampin' Up! take the guess work out of colour coordination! All of the card stock, papers, inks, ribbons and other accessories are designed in colour families for easy mix and match. 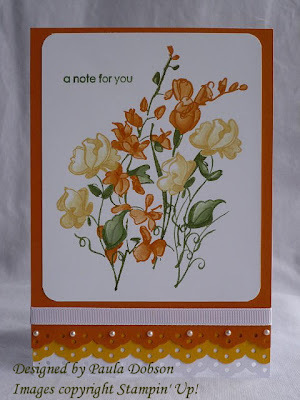 This card invloves only two colours, but I have used card stock, inks, papers and other accessories - you can see how well everything matches. 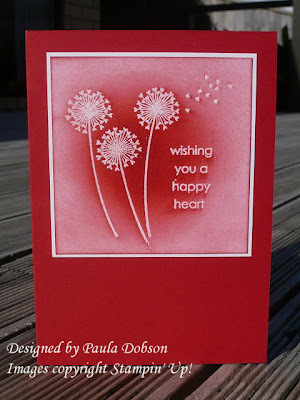 It gives you a great place to start if you are new to Paper Craft. Just choose one of the four colour families and build your craft stash from there. It is a cost effective way to start your collection, because you already know that everything will coordinate. Once you feel more confident, you can add another colour family. 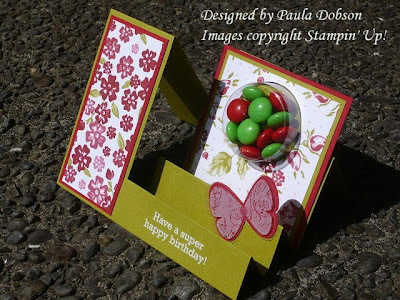 This little cutie is called a "Joy Fold" card. 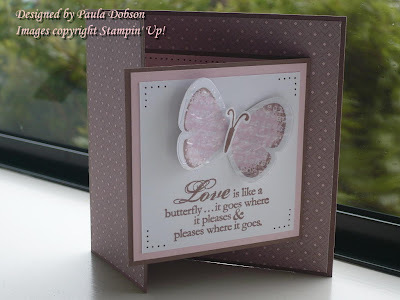 I have used the Rock & Roll technique to stamp the butterfly. I am teaching this technique on the 8th of February. If you would like to learn this effective technique, email me and book your place today! To be able to go and pick some flowers!! Wellington's weather has made top billing in the News two days running. Middle of January and I am in winter clothes!! I made this card just dreaming of being able to get outdoors! My garden is running a muck and I could really use this little boys help in getting it tamed! I have spent the day blog hopping today and have seen so many beautiful ideas and projects. Aren't we lucky to have this fabulous resource called the internet? I have my classes resuming next week and really should have been prepping for them, but got side tracked. I ended up with this card instead! I love the deep colour of the purple next to the wonderful apricot. It really makes the card pop. 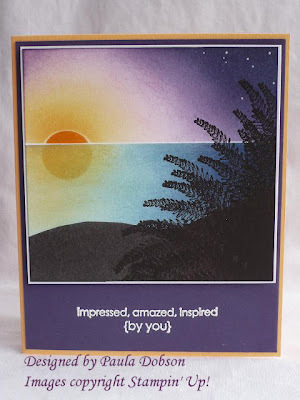 I have used a lot of colours in this card to create the sunset and have used my sponges to get the graduated colours just right. Accessories: White Gel Pen (for the stars), adhesive, embossing gun, white embossing powder. A friend of mine has asked me to do her Wedding Invitations. She has a definite theme in mind which will certainly test my level of skill and unlike any wedding theme I have heard about! Having said that, I am really honoured that she would like me to make them. 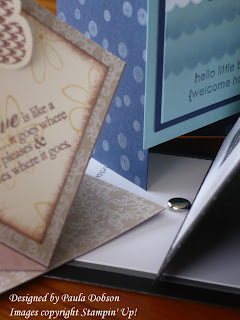 It has had me thinking, that I really haven't made a wedding based card for quite some time. So to get back into the swing of things, I thought I had better turn out a couple of more traditional cards, just to limber up!! 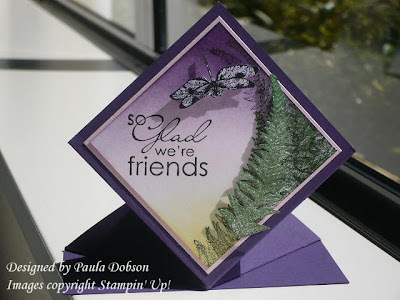 I don't have any gold or silver card stock at the moment, but these days anything goes, so I used the Stampin' Up! regular card stock in grays and white. I wanted to keep it simple, but elegant. The So Swirly jumbo wheel ($18.95) is very elegant and really didn't need anything added to it, and with the Eyelet Border punch ($35.95) in coordinating layers of gray, I really only had to add a sentiment and some pearls to finish. And not a moment too soon! I was making a Spring card for a friend of mine when I had an idea for another. Do you like it? 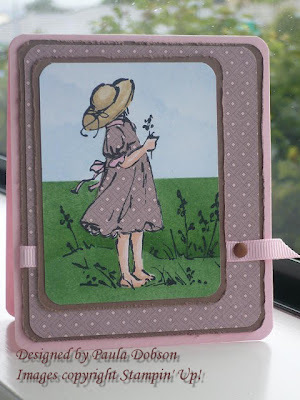 I will be teaching my lovely ladies how to make a spring card in my Fancy Folds class on the 25th of January. Am I a tease or what!! If you would like to see and learn to make these delicious projects, then be sure to register your interest by the 18th. There are still seats available, but be quick!! Use my "Contact Me" link on the right to email me. Thank you all for your kind comments on my last post. I am really not joking when I told you my mojo had gone though. It was really painful trying to come up with anything worth publishing!! But I am pleased to report that things are starting to happen again, and not too soon either, as my classes are starting back soon. I am prepping for the Fancy Folds class at the moment. Keep checking back here over the next day or two and you will get a sneak peek at what we will be making! 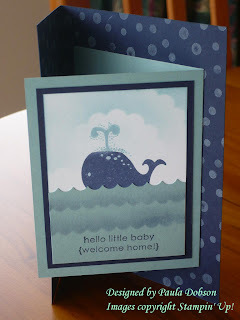 In the meantime, here is another "doodle" card I made the other day with my favourite retired set "Summer by the Sea". Hope you like it. I am still having trouble crafting, boohoo. I stood and stared at my craft room today just waiting for inspiration to hit me - it didn't!! So I just got out some of my stamp sets and started mucking around. It is amazing what you can create when just playing. I had no clear picture of what I wanted to achieve, but now that is is finished, I am really happy! This is a card I would gladly do again, or even alter just a little. I really love the colour combination of Eggplant and Sage, that was a happy accident too, lol. To add depth to the flowers, I have stamped and coloured twice, cut out one set and adhered to the original stamped image using SU dimensionals. I hope everyone had a safe and Merry Christmas. I had a lovely time in Whangarei with family and friends. Hard to believe we have been and come back already! I also had a break from ANY crafting for nearly two weeks! I thought I would be rearing to go when I got back from holiday, but the truth is, my Mojo hasn't come back with me, lol!! Luckily, my Mother-in-law asked me to make a couple of Thank You cards for friends who have tended her garden while she was away. That gave me something to focus on (Thank goodness!). Santa was very good to me and gave me 2 new stamp sets for Christmas and I just had to use one of them for these cards. 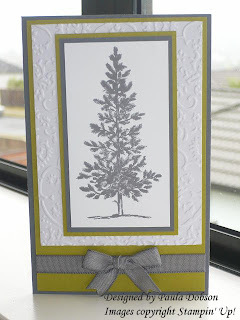 Lovely as a Tree is such a versatile set and one of my favourites.